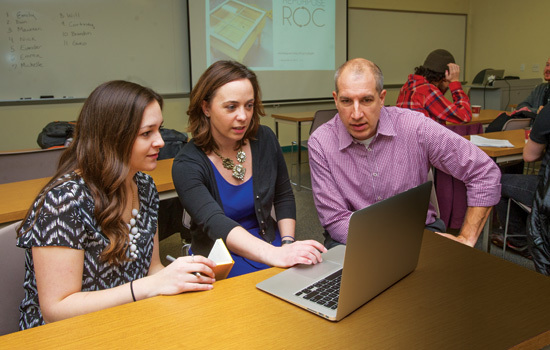 Victor Perotti, chair of management information systems in Saunders College of Business, and Andrea Hickerson, center, assistant professor of journalism in the College of Liberal Arts, have teamed up to create a unique interdisciplinary course—Digital Journalism Incubator. Students representing many RIT programs, such as Cortney Myers, a fourth-year visual media student in the College of Imaging Arts and Sciences, learn at the intersection of journalism, computing and entrepreneurship to present compelling news products and services using the latest digital tools. RIT owes much of its past success to the alacrity with which it has been able to anticipate and respond to changes in the multiple environments in which it operates. In the next decade, these shifts will accelerate and in some cases expand to the level of seismic change, requiring us to develop innovative practices and policies that facilitate and encourage good ideas and the changes they lead to. In other words, we need to maximize our organizational agility. “Organizational Agility” is more than a dimension: it is a strategic imperative and the linchpin of this plan. Underlying every difference-making goal in the previous pages is the assumption that our institutional culture will be agile and efficient—that we will be able to make decisions with dispatch; to move at least as quickly as the drivers of technology, science, and the global economy; and to reorganize as often as necessary to support the key themes of this plan (academic excellence in teaching, learning, scholarship and research; interdisciplinarity; diversity; and affordability). At the same time, we must recognize that a defining element of organizational agility is the ability to respond to these external dynamics and opportunities without traumatic change to the organization. Our deep commitment to the sustainability and resiliency of the planet will require us to stay abreast of the latest research, to deploy the most current, appropriate, and efficient tools, and to move quickly in responding to sustainability imperatives. The Difference Makers here could have introduced every dimension in the preceding pages, but they are so important to the success of Greatness Through Difference that we have given them pride of place as the final words of this document. RIT’s curricular, administrative, and organizational structures will serve—not impede—discovery, border crossing, and collaboration among students, faculty, and staff. RIT will reduce academic and administrative silos and diminish the lingering negative effects of a silo culture. Following a thorough budget and space audit, RIT will create a master space plan. RIT will develop a university culture that is less risk-averse and less bureaucratic; it will streamline compliance measures and empower local decision-making responsibilities. In the service of ensuring a sustainable planet, RIT will restore, ameliorate, and work within the systems and resources necessary to meet the needs of the current generation in an equitable manner without jeopardizing future generations. RIT will cultivate global citizens and leaders prepared to address the inter-connected ecological, economic, social, and ethical challenges of creating a sustainable future. To see the entire Strategic Plan, go to rit.edu/president.